New York City To Teens: TXT ME With Mental Health Worries : Shots - Health News In an effort to connect teenagers with mental health services, New York is testing counseling via text for high school students. They join a growing trend. Most teenagers with mental health problems don't get any help. The majority of teenagers with mental health issues don't get help. But maybe if help were just a text message away — they wouldn't be so hesitant to reach out. 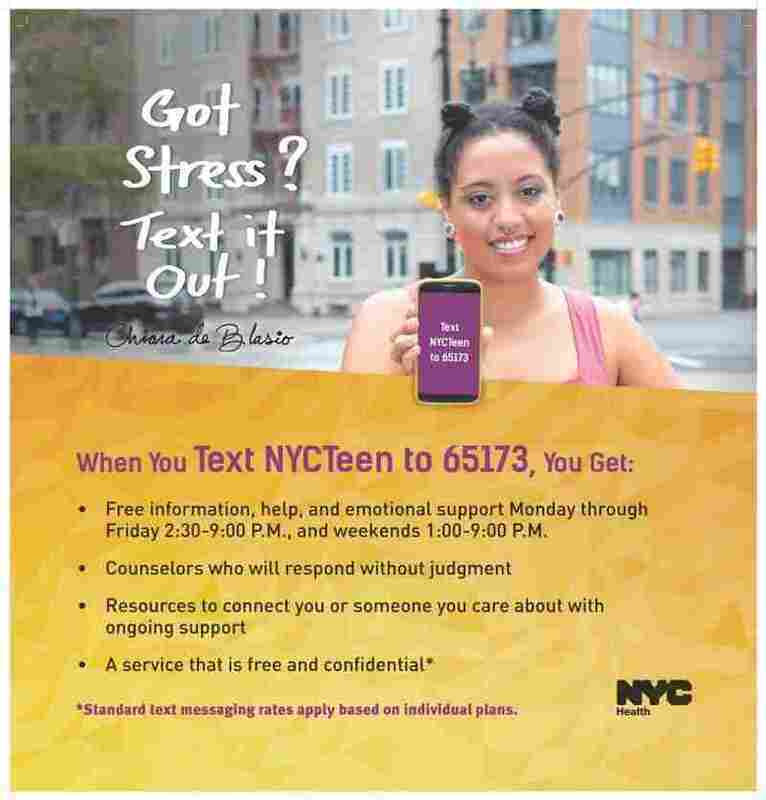 That's the thinking behind NYC Teen Text, a pilot program at 10 New York public high schools that allows teens to get help with mental health issues by text. Chiara de Blasio, the 20-year-old daughter of Mayor Bill de Blasio who has been vocal about her own struggles with depression and substance abuse, helped launched the program. "I know from personal experience that reaching out when you're in pain can be the turning point – the first step on the road to recovery," she said at a press conference on Tuesday. The initiative is managed by the city's health department in collaboration with the Mental Health Association of New York City, which already runs a citywide crisis phone service. "I know from personal experience that reaching out when you're in pain can be the turning point – the first step on the road to recovery." 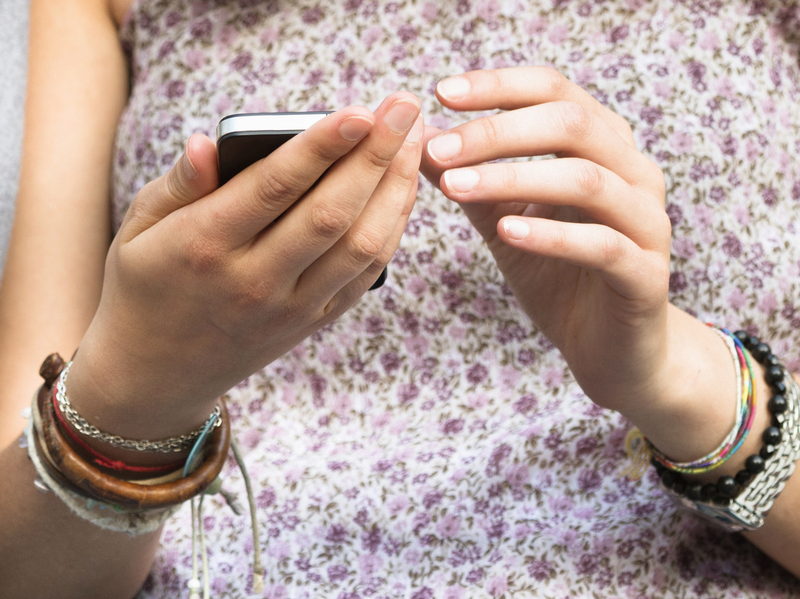 "Teens can be more candid on text than even in a phone conversation or in person," says John Draper, director of the National Suicide Prevention Lifeline, which helped design the Teen Text program. "This generation of teens make and break up relationships by text. So you can get pretty strong levels of intimate conversation with text." The program is inspired by similar initiatives, including the Teen Line service in Los Angeles and the Crisis Text Line — which is available 24/7 for teens all over the country. The advantage of having a local service is that counselors can look up and recommend local counselors to teens who need extra help. "We have more than 2,000 providers in our databases," Draper says. And when teens who text the helpline appear to be in imminent danger of harming themselves or others, counselors can work with the local police department to track them down make sure they're safe. But the text-based approach poses a few challenges, as well, Draper says. "One of the tricky things is making sure we're communicating our empathy. You can't hear someone say 'Mhm, mhm' over text." Counselors who operate the text line receive extra training, Draper says. "Over text, counselors go out of their way to make it clear that they're actively listening. We may say something like 'It sounds like this loss has been terribly devastating for you, I'm so sorry to hear that.' "
And teens who reach out to such services may need extra validation, Draper says. "The whole world could be black today and it may feel like that's the way it will be forever. They don't have life experience telling them that this is going to end and get better," he says. "The counselor's job is to really be there in the moment so they learn that they can get through this." Privacy is another concern. "We use encrypted messages and store all the information in secure databases," Draper says. "Still, on their end, we have no control over what they do with their information. The advantage of keeping the texts on their phone is that they can read and reread these messages that were useful or important to them. But we do warn them — if they're concerned about someone seeing, they should forward their texts to a more secure setting." "I was very excited about this program," says Nadine Kaslow, the president of the American Psychological Association and vice-chair of Emory University's psychiatry department. "I think it has a great deal of potential." In-person counseling is the best, most effective way to help teens with mental health trouble, says Kaslow, who isn't involved with the Teen Text program. "But there will be some subgroup of teens where this text service is the only way to connect with them." There is a lack of research on the long-term efficacy of text and mobile app based services, she notes. "The issue is that everything is anonymous and there's no way to follow-up with them to see if they ended up seeing a counselor later, or if they're doing better." The NYC Department of Health and Mental Hygiene will be tracking the number of students who use the new service, and they're planning on gathering feedback from students at the 10 pilot high schools, according to Gary Belkin, the executive deputy commissioner for mental hygiene. If the program is successful, the health department hopes to expand it and promote it in high schools citywide.